Barry Wallace longs to see the church "passionately move forward in God-glorifying, laziness-jolting, one-other-inflaming obedience in our worship." What we can learn from a different Calvin. Thus it is necessary, that God’s awful majesty, his authority and dreadful greatness, justice, and holiness, should be manifested. But this could not be, unless sin and punishment had been decreed; so that the shining forth of God’s glory would be very imperfect, both because these parts of divine glory would not shine forth as the others do, and also the glory of his goodness, love, and holiness would be faint without them; nay, they could scarcely shine forth at all. If it were not right that God should decree and permit and punish sin, there could be no manifestation of God’s holiness in hatred of sin, or in showing any preference, in his providence, of godliness before it. There would be no manifestation of God’s grace or true goodness, if there was no sin to be pardoned, no misery to be saved from. How much happiness soever he bestowed, his goodness would not be so much prized and admired. Damien Garofalo recaps the Sovereignty of God Conference. Tom Ascol recaps the 2009 Southern Baptist Convention. 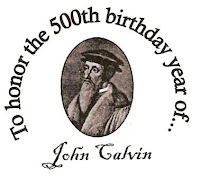 A list of some of the events around the world commemorating the 500th anniversary of John Calvin's birth. Thanks for the link, Lee. I've always enjoyed reading your blog, and have now added it to my blog roll. Grace and peace to you. I guess, then, Paul was wrong in describing his anguish over those Jewish brethren who were not saved right before he explains WHY they're not saved in Romans 9. Too bad he wasn't being "logical" or "consistent" enough for Mr. Birch. Mr. Birch's objection is indeed "logical" - by human standards. Just not by biblical ones. Oh, I see. Paul was as conflicted as is your God. He "wanted" or "desired" for the salvation of all the Jews, he just recognized that God did not want or desire their salvation. Oh wait, it seems that Paul DID confess that God wanted their salvation (1 Tim. 2:4; cf. Ezek. 33:11). 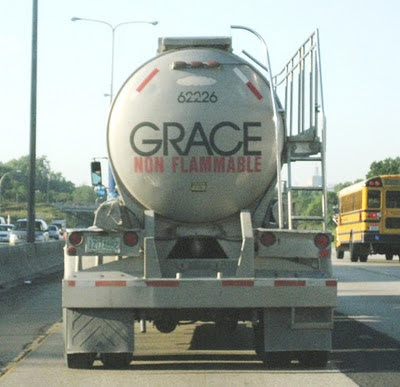 It isn't Paul or God who is being illogical - it is the Calvinist's contorted (mis)interpretation of Romans 9 which makes for a rather unbiblical theology (i.e. Calvinism).